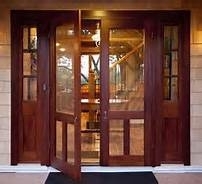 Bring fresh air in and keep bugs out with screen doors at your home’s entrances. We carry YesterYear’s screen doors for the historic home or for those who want to add a vintage look to their home. YesterYear provides a very large selection of door designs, panel patterns and screen options to meet any home requirement. We stock a variety of aluminum and fiber screen mesh and are able to rescreen ripped or damaged screen mesh within a couple of days. We also carry pet resistant screen mesh for those little friends that tend to give your screens some work. Flower City Glass can find most replacement screen frames for our customers based on availability of the products.